John Davies was born in Sydney on 2 March 1839, son of John Davies, blacksmith, and Honorah, née Roberts. On 3 April 1861 he married Elizabeth Eaton according to Presbyterian rites. He died on 23 May 1896, survived by one son and five daughters, and was buried in the Anglican section of Waverley Cemetery. A baptised Catholic, he became a militant Protestant. Davies had little education and at age nine worked as a messenger in an ironworks, later becoming a blacksmith. In 1864 he set up as an ironmonger and blacksmith in George Street, Sydney, moving to York Street in 1867. He became a magistrate in 1875. He owned several houses in Surry Hills and had a private residence at Campbelltown. Davies was president of the Protestant Friendly Society in 1864 and in 1868 became president of the newly formed Protestant Political Association. He was acting British commissioner at Sydney for the Melbourne International Exhibition in 1879, commissioner for the Amsterdam Exhibition in 1882, South Kensington in 1886, and the Adelaide Jubilee and Melbourne Centennial Exhibitions in 1887. He was chairman of the Royal Commission on Friendly Societies, 1881-82, and a member of the Royal Commission on Intoxicating Drink in 1886. He was Director of Randwick Institution for Destitute Children, Director of Sydney Hospital, and the Mutual Life Association of Australasia, and Treasurer of the Sydney Night Refuge. As chairman of the Casual Labour Board from 1887, he was accused of embezzlement but was acquitted in July 1889. He was Head of the Good Templar Organisation and Chairman of the NSW Alliance for the Suppression of Intemperance. Davies? political beliefs, based on his strict temperance principles and membership of the Loyal Orange Lodge, made him many enemies. He was elected as MLA for East Sydney on 9 December 1874, becoming Postmaster-General from August to December 1877, but he lost his seat in 1880. 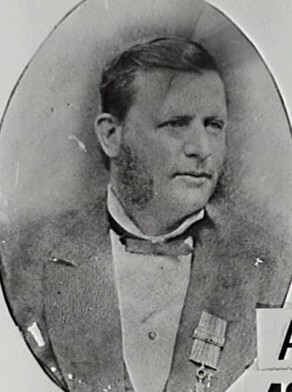 He was elected for South Sydney on 18 November 1880, was defeated in 1882 and regained his seat from 1885 to 1887. He was a member of the Parliamentary Standing Committee on Public Works until his death. Davies was appointed to the Legislative Council in 1887. Davies was awarded Commander of the Order of St Michael and St George in 1879 (CMG). Davies was elected Alderman for Cook Ward, 1 December 1874 to 30 November 1882. Bede Nairn, ‘Davies, John (1839–1896)’, Australian Dictionary of Biography, National Centre of Biography, Australian National University, http://adb.anu.edu.au/biography/davies-john-3375/text5103, accessed 21 January 2013.